Venice has been used as a stage for many books before, but this time the City of Water is the perfect background for a very original story which involves a parallel world, mermaids, ghosts, speaking statues and many more out of this world characters. Teodora, in brief Teo, is a young child who is catapulted into this fantasy world of mystery, magic and prophecies thanks to a book: The Key to the Secret City. She is only a little girl who has been adopted by a family from the South of Italy and who goes to Venice on holiday. Here she is going to meet many new friends like Renzo, a Venetian boy who will reserve her many surprises and Maria, who is not who she seems. But in Venice she will also find many enemies, starting from the Traitor, who has returned from the past to create havoc in the city and bring it to destruction. 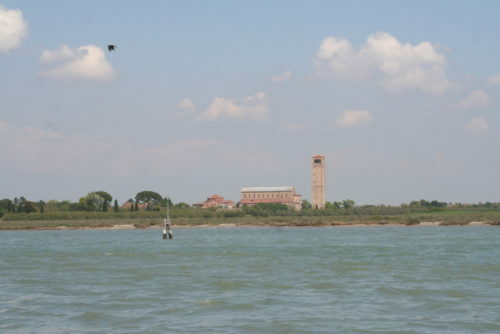 Venice and its lagoon are always at the centre of the story, sometimes with actual historical facts, most of the time with its legends and curiosities. Whilst unveiling the story, the writer manages to give the reader a particular insight of Venice. Even though it is set more than one hundred years ago, the dangers and problems threatening the city are so current and they are brought so close to the present that you feel you are there living the story with Teo and Renzo. And whilst reading you are walking though the campi, the calli, the canals of Venice and you feel like you are there. Or at least that’s how I felt. If you are thinking of going to Venice with your children and want them to know about the City of Water before they get there, this is the perfect book for them. It will entice them, they will want to go and find each single one of the places mentioned in the story. And with a little map at the beginning of the book pinpointing the most important sites of which the books talks about, this fantasy treasure hunt could not be easier. I really enjoyed reading this book, even if it was a children book. Michelle Lovric has managed to bring out of Venice not only the magic that always surrounds this city and that sense of mystery which always emerges from it, but also those day to day aspects of Venetian life, which many times tourists and visitors ignore or forget about. The book is followed by a sequel which goes by the title of The Mourning Emporium: I will post about it pretty soon. Michelle Lovric has written many other books about Venice: her love for this city transpire in each word she writes. The Undrowned child is also available in Italian. Previous PostTraditional Food in Venice: Tale of a Venetian Frittelle Marathon! Next PostThe fate of Venice: sinking or crumbling? Sounds really good! I have recently read The Prince of Mist by Carlos Ruiz Zafón and I’ve enjoyed it so much… Who says that children’s books can’t be read by adults? !